Pibulsongkram Rajabhat University’s history started in 1921. That year the government announced the Primary School Act that everyone had a chance to study. So there was a great demand for teachers. Phitsanuloke Region tried to produce teachers by adding teaching courses at the Phitsanuloke Phittayakhom school M5 and M6 classes. The students who finished the course would be teachers in government schools. 1926 Phitsanuloke Region received a budget from the “Ministry of Education” and donations from people in Phitsanuloke to build the regional teacher training school at Chan Palace Area. His Majesty King Rama the Seventh named the school “Phitsanuwittayayon School” and went with Queen Rumpaipanni to the opening ceremony on the 7 January 1926. However after the school had been moved to a new location, there was a fire. So the school was forced to closed. 1933 the Ministry of Education opened a teacher training program at the Phitsanuloke women’s school. The program offered many teaching certificate courses. In 1943 the teacher training program and Chalermkwan Satree School were separated to be the Phitsanuloke women teacher training school but was still in the same area. Since 1933 the women’s teacher training school was affiliated with the special education department. 1954 Ministry of Education established teacher training divisions so the Phitsanuloke women teacher training school was affiliated with a teacher training committee and changed the courses to become an Education Certificate. In 1955 the government rebuilt Chalermkwan Satree School across the river from its former location. 1 June 1956 “Women Teacher Training School” was separated from Chalermkwan Satree School to a new location at Wangchan Road on 23 June 1956 and it changed its name to Pibulsongkram Teacher Training School. It offered co-education for boarding female students and day- time male students. In 1961 the school was graduated to Pibulsongkram Teaching College. It offered many courses such as higher education certificate, education certificate, part-time primary school teacher certificate and Bachelor of Education in Thai language teaching. 1975 The government announced the Teaching College Act and formed the teacher training council to give policy and manage all teaching colleges in Thailand. The college was organized in faculties, offices, and centres. 1976 Education teaching council dissolved Education Certificate curriculum and submitted two levels of education; Higher Education Certificate (HEC) and Bachelor of Education (B.Ed). The college didn’t offer the courses for part time students but opened for HEC students to study from 5.00 – 7.00 PM during weekdays. 1979 the college initiated an “on duty” teacher training project. It offered both Education Certificate and Higher Education Certificate to working educators on weekends and canceled the evening classes. 1981 The college received 1000 rai of land in “Thung Thalaykaew” to establish new campus from the office of the Prime Minister. The college used only 400 rai for the first project. 1984 There was a correction in the Teaching Collage Act to enable teaching colleges in Thailand to teach other Bachelor degrees, therefore Pibulsongkram established the community college at “Thung Thalaykaew” to offer Professional Certificate courses. 1987 The college ended the “on duty” teacher training project and started weekend education projects for both junior degree and bachelor degree. 14 February 1992 His Majesty the King give the name “Rajabhat” to all Teaching collages. Rajabhat Institute Pibulsongkram used the curriculum according to 1994 Rajabhat Act. 15 June 2004 His Majesty the King approved the 2004 Rajabhat University Act. The Act was published in “Phra Raja Kitchanubeksa” on 14 June 2004. 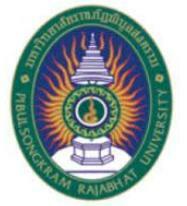 Therefore Rajabhat Institute Pibulsongkram was inaugurated “Pibulsongkram Rajabhat University” on 15 June 2004. Pibulsongkram Rajabhat University has the highest standard for an academic university.We serve the community for the sustaining development.